Singapore Freebies: Burger King: 1,000 Free Whoppers Giveaway!! 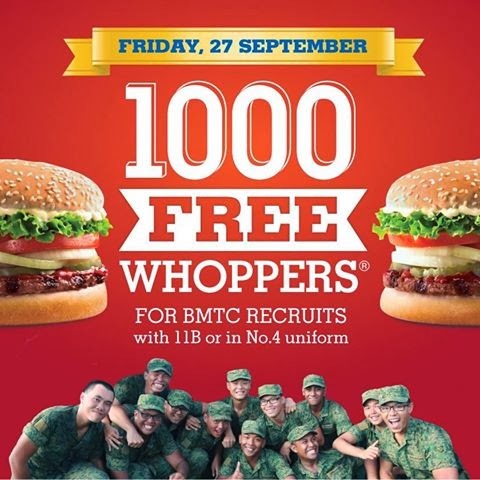 Burger King: 1,000 Free Whoppers Giveaway!! will be available at 50% off for you people! The WHOPPER® is America favourite burger. First off a hot broiler in 1957, the WHOPPER®; boasting a quarter pound of flame-grilled beef, ripe tomatoes, crisp lettuce, creamy mayo, ketchup, onions and crunchy pickles on a toasted sesame seed buns, has become an iconic burger for the ages and boasts generations of fans worldwide. There are 221,184 possible ways for a guest to order an original WHOPPER®. What began as a flame-grilled favorite now serves as the ultimate symbol of consumer customization, empowering people everywhere to HAVE IT YOUR WAY®.